The Solar Eclipse has passed! We have all survived the hordes of people coming in to experience the awesomeness of nature. 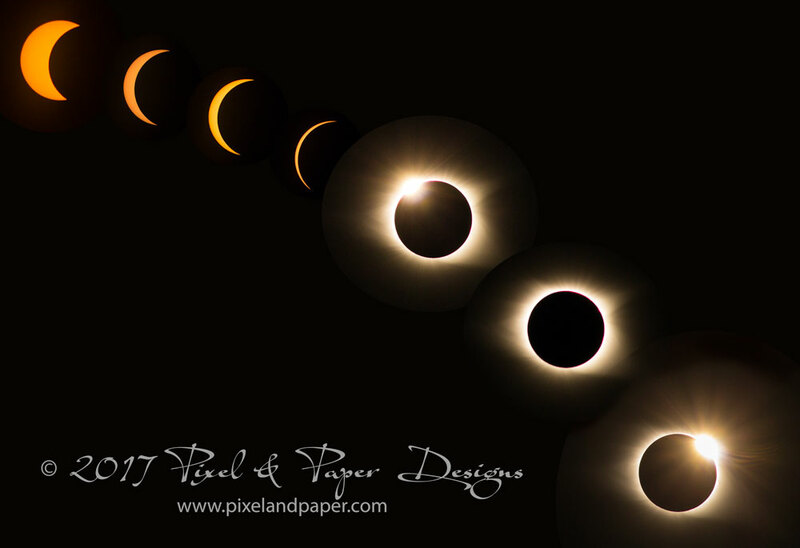 My web lady, Stephanie Hobbs, took an awesome time lapse of the eclipse that she let me include in this month’s newsletter. Not sure what to do with your eclipse glasses now that it’s over? Unless you are planning to go to Texas in 2024 (and your glasses meet NASA standards) then feel free to drop them off at Raspberry Moon Skin Therapy and we will send them to Astronomers Without Borders! I think this is cool – I was going to look up what to do with them and I saw this! So this is just a courtesy reminder about your appointment times. I realize that things happen and I will be as accommodating as I can. Please be advised that less than 24 hour notice to cancel or reschedule your appointment is subject to payment up to the cost of your service. I’m a pretty easy person to get ahold of, though it may take me a little bit to get back to you. You can CALL or TEXT 864.271.2710, email me at RaspberryMoonST@gmail.com or even message me on Facebook (just know that sometimes notifications don’t show up right for this method). If I haven’t responded within the business day please remind me. Sometimes things get so busy here that I forget to do things, or think I’ve done them and haven’t! Keep your confirmation emails as there is a link to your appointment that you can change should you need to. Calling me less than one hour before or on the morning of your appointment time allows me no time to call a client on my waiting list. Please text or email me the night before. This allows me to reach out to clients first thing in the morning. 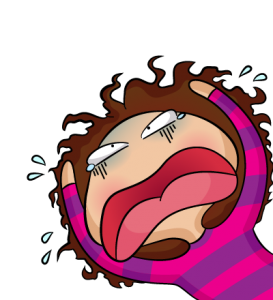 Also as a reminder, I do not answer the phone during client times. I can usually answer back quicker via text or email. If you need something from me please leave me a detailed message (name, number, service requested, and desired appointment times) so I can answer back efficiently. 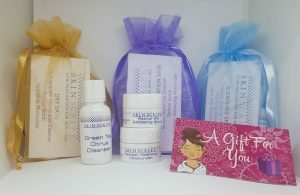 Through the month of September receive a FREE 3 piece Skin Scripts Skincare Travel Size goody bag (a $5 value!) with $50 in retail purchases, plus get a gift certificate for $10 off a $25 retail purchase in October. Christmas isn’t that far away, so this would be a great opportunity to get ahead of the game! We’ve got awesome little stocking stuffers, yummy aromatherapy, our fabulous sun protection, skincare for baby, and of course our new Skin Script skincare. Celebrate Fall (the weather this week gave us a great teaser for it!) 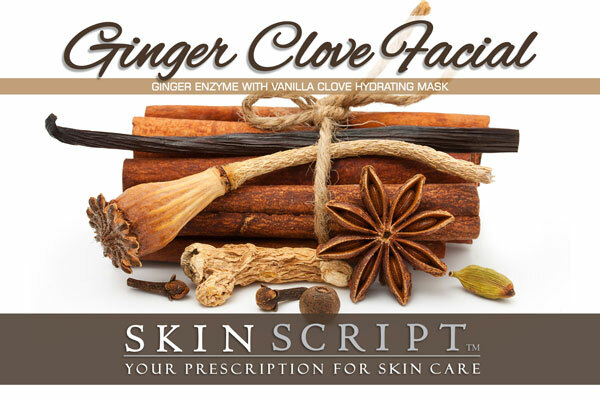 with our new Ginger Clove Facial. The Ginger Enzyme contains 2% salicylic and 2% mandelic acids to refine pores and brighten/exfoliate the skin. Ginger, marbleberry, cinnamon, and clove are anti-inflammatory and antioxidants; they will stimulate microcirculation and create a warming sensation. The Vanilla Clove Hydrating mask is packed with antioxidants and moisture. Glycerin and mushroom hydrate, firm and improve the skin’s tone. Clove, vanilla, mangosteen and cranberry are potent antioxidants and scavengers of free radicals. Ice Globes will be used over the mask to cool the skin. All combine to create the perfect anti-aging, antioxidant facial. Skin Conditions: Anti-aging, normal/combination. Due to the warming and micro-circulation effect, it may not be suitable for very sensitive or rosacea skin types. Though the enzyme can be tamed down for those a little more sensitive. 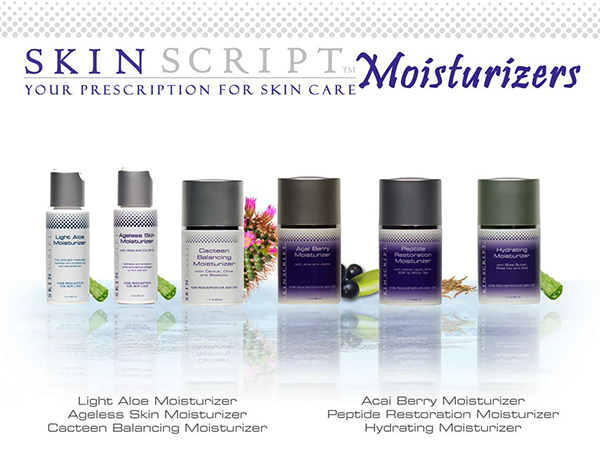 Last month I introduced the new Skin Script Line Cleansers (if you missed it check out August’s Newsletter), this month it’s all about the moisturizers. With 6 different moisturizers to choose from, there is one for every skin type and budget! Directions for use: Use Daily / Morning and Night to intensively re-hydrate the skin. Apply after cleansing and exfoliating the skin. For oily, acneic and impure skin. The Light Aloe Moisturizer normalizes and hydrates skin without leaving a heavy feel or film behind. Antioxidants and skin soothing agents in the moisturizer minimize irritation and environmental damage, resulting in clear, healthy skin. For dry and dehydrated skin. The Hydrating Moisturizer improves the appearance of wrinkles with intense hydration. It binds moisture in the skin, soothes, calms, and strengthens capillaries. For normal/combination and sensetive skin. The Ageless Skin Moisturizer provides hydration without leaving a heavy feel on the skin’s surface. It promotes hydration that protects from environmental damage while relieving the surface signs of aging. This anti-aging, nourishing, vitamin-packed moisturizer hits the gammet for a lot of skin types – from normal to dry skin to combo or sensitive. Provides hydration, leaving the skin feeling very soft and protects from environmental damage while relieving the surface signs of aging. Researchers have found that, among many other medical and cosmetic benefits, acai berries contain extremely high concentrations of antioxidants which have been shown to combat the signs of premature aging. Antioxidants protect from environmental damage while relieving the surface signs of aging.